With the end of major operations on the St. Mihiel front, the main effort of Pershing and the AEF shifted forty miles to the northwest along the west bank of the Meuse. Over the next two weeks, the AEF executed a complex and massive movement of troops, artillery, and supplies to its new battleground. The transfer involved 820,000 men: 220,000 French and Italian troops left the area, and about 600,000 Americans entered. Of the fifteen American divisions that took over the sector, seven had been involved in the St. Mihiel operation, three came from the Vesle sector, three from the area of Soissons, one near Bar-le-Duc, and one from a training area. The movement was confined to the hours of darkness to maintain secrecy and further limited by the availability of only three roads capable of supporting heavy traffic. That it took place without a serious setback was largely attributable to the careful supervision of a young staff officer from Pershing’s First Army, Col. George C. Marshall. The AEF’s attack into the Meuse-Argonne region was part of Foch’s larger general offensive against the Germans, with the British and French attacking in their respective sectors, which would force the Germans to defend the entire front. Foch’s objective was to cut the enemy’s vital lateral rail lines and compel the Germans to retire inside their own frontier before the end of 1918. For this grand offensive, Foch had 220 divisions, of which 42 were the big divisions of the AEF. The American First Army would attack northward in conjunction with the French Fourth Army. Its main objective was the rail line between Carignan-Sedan-Mézieres, an artery of the important rail system running through Luxembourg, Thionville, and Metz. That objective was about thirty miles from the jump-off line north of Verdun. In addition, by attacking east of the Argonne Forest, the First Army’s offensive would outflank the German forces along the Aisne, in front of their French counterparts to the west. For their defense of the area, the Germans took full advantage of the rugged terrain. The high ground on either flank gave them excellent observation points from which to rain artillery on the Americans. Moreover, like the St. Mihiel salient, the Germans had occupied the area for several years and had developed an elaborate defensive system of four fortified lines featuring a dense network of wire entanglements, machine gun positions with interlocking fires, and concrete fighting posts. In between these trench lines, the Germans had developed a series of intermediate strong points in the numerous woods and knolls. The defensive system was about fifteen miles deep with five divisions on line and another seven in immediate reserve. Petain believed that the defenses were so strong that the Americans would do well if they captured Montfaucon, on the second line, before winter. Against this imposing defense, the American First Army mustered over 600,000 men. It would attack with nine divisions on line and another five in reserve, with Bullard’s III Corps on the east flank, Cameron’s V Corps in the center, and Liggett’s I Corps on the west flank. A total of 2,700 pieces of artillery, 189 tanks, and 821 aircraft supported the American infantrymen. Pershing and his staff envisioned the offensive in two stages. First, U. S. forces would advance about ten miles and penetrate three of the German lines, clearing the Argonne Forest to link up with the French Fourth Army at Grandpré. The second stage would consist of an advance of ten miles to outflank the enemy positions along the Aisne and prepare for further attacks toward Sedan and Mézieres on the Meuse River. Additional operations would then clear the heights along the east bank of the Meuse. The initial attack would kick off on 26 September. The operations plan called for two thrusts on either side of the high ground around Montfaucon, with a linkup achieved before the Germans could bring in additional reinforcements. The V Corps would make the main attack, taking Montfaucon and penetrating the second German line. On either side, the I and III Corps would advance to protect the army’s flanks, while their corps artillery suppressed the German artillery. Pershing wanted to seize Cunel and, to its west, Romagne, by the end of the second day. At 0530, after a three-hour artillery bombardment, the three corps launched their attacks. Despite a heavy fog, the rugged terrain, and the network of barbed wire, the weight of the American onslaught quickly overran the Germans’ forward positions. On both flanks, the corps made good progress. In the III Corps sector, Maj. Gen. John Hines’ 4th Division pushed ahead about four miles, penetrated the German second line, and defeated several counterattacks in the process. On the western flank, Liggett’s corps reached its objectives, advancing three miles on the open ground to the east of the Argonne. Maj. Gen. Robert Alexander’s 77th Division made lesser gains in the Argonne itself. In the center, however, the V Corps experienced problems and was checked to the south of Montfaucon; it was not until the next day that Cameron’s men were able to seize the position. Throughout the remainder of September, the First Army slowly plodded forward. Heavy rains on 27-28 September bogged down the few tanks that had not already succumbed to mechanical failure. The rains also interfered with the forward movement of the supporting artillery and the resupply efforts as the already congested roads became muddy. Moreover, the Germans had used the delay in front of Montfaucon to rush local reserves to the strong positions in the center of their line, south of Cunel and Romagne. As the American battalions and companies encountered German machine gun positions in depth, the advance slowed further. Once the American infantry silenced the forward positions, supporting guns to the rear opened fire. In addition, the German artillery poured enfilading fire onto the attackers from the heights of the Meuse and the Argonne Forest. The advance had become a continuous series of bloody, hard-fought engagements. Not all the First Army’s difficulties came from the enemy or the weather. Of the nine divisions in the initial assault, only three (the 4th, 28th, and 77th) had significant combat experience. The 79th Division, which had the critical mission to take Montfaucon, had been in France for only seven weeks. The heavy fog and rain and the broken terrain exacerbated the situation for the inexperienced troops. Many divisions suffered from a lack of coordination among their own units and liaison with adjoining and higher units. Teamwork between the infantry and their supporting artillery often proved awkward and ineffective, especially in those divisions that had to rely on artillery brigades from other divisions because their own brigades were unavailable. During the first days of October, Pershing took advantage of the pause to rotate three battle-hardened divisions (the 3d, 32d, and 1st) into the line, relieving some of the less experienced (the 37th, 79th, and 35th). As the First Army reorganized its line, the Germans also strengthened their position with six new divisions brought into the area for a total of eleven. The numerical odds were beginning to even. At 0530 on 4 October the First Army renewed its general attack. The III and V Corps were to take the heights around Cunel and Romagne, respectively. Meanwhile, the I Corps was to neutralize the enemy’s flanking fire from the Argonne and gain some room to maneuver around the forest. The fighting was especially severe. The American infantry launched a series of frontal attacks to penetrate the German lines and then to exploit the exposed enemy flanks. Progress was slow. The III and V Corps made some gains against their objectives, but the Cunel and Romagne heights remained in German hands. On the west, the 1st Division advanced three miles and the I Corps captured an important ridge on the east edge of the Argonne. As new American divisions were rotated into line, the Germans continued their reinforcement efforts; and by 6 October they had twenty-seven divisions in the area. As the two corps on the east continued their fight for high ground in the center of the First Army sector, Liggett’s I Corps executed an effective flanking operation. On 7 October, as the 77th Division attacked northward in the Argonne, Liggett sent the 82d Division almost due west into the rear of the German positions. By noon the Germans were withdrawing from the forest. By 10 October, the I Corps had cleared the forest. With the divisions of First Army fighting in the Meuse- Argonne region, other American divisions were providing crucial assistance to the French and British advances. To the north, two divisions of General Read’s II Corps continued to support the British advance. The 2d Division (now commanded by Maj. Gen. John A. Lejeune of the Marine Corps) operated with the French Fourth Army on the First Army’s western flank. Lejeune’s soldiers and marines captured Mont Blanc Ridge, which provided the only natural defensive line south of the Aisne River, in a hard-fought battle from 2 to 4 October. On 10 October the 36th Division relieved the 2d Division and advanced to the Aisne River by 13 October, which brought the French Fourth Army on line with the American First Army. On 8 October Pershing had the French XVII Corps attack across the Meuse near Brabant, due east of Montfaucon. The corps’ two French and two American divisions advanced two miles and captured 3,000 prisoners and several important observation points. This limited operation also forced the Germans to divert divisions away from the main battleground between the Meuse and the Argonne. On 14 October the First Army launched a general assault all along the German lines. The III and V Corps once again aimed at taking the fortified hills and forests of the Cunel-Romagne front. Over the next four days the 3d, 5th, and 32d Divisions battled for and captured the vital strong points. On the western flank, the I Corps advanced to the southern half of Grandpré on 16 October. By the third week in October the First Army had reached most of the objectives of the first phase of the campaign: penetration of the third German line and clearing of the Argonne. By mid-October Pershing realized that too much of the operational and tactical direction of the war was concentrated in his hands. As AEF commander, he was the American theater commander responsible for the administration, training, and supplying of the American troops in France as well as coordination with the other national commanders. In addition, he was the field commander for three corps of fourteen divisions in a desperate fight over rough terrain. Moreover, the First Army had become unwieldy, with over a million men along an 83-mile front. 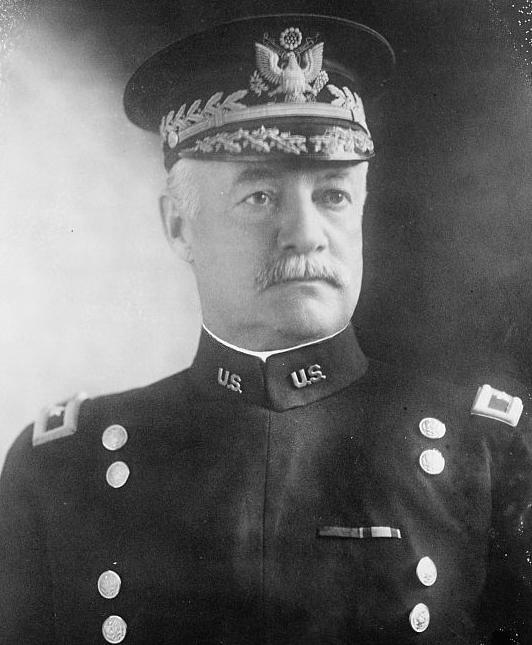 On 12 October Pershing organized the American Second Army and named Bullard its commander. Bullard and his army assumed control over thirty-four miles of the front-the quiet sector between the Meuse and the Moselle south of Verdun. The active Meuse-Argonne sector remained the First Army’s responsibility, and on 16 October General Liggett assumed command of that army. Pershing could now focus his attention on the larger strategic issues of theater command. After visiting the First Army’s corps and divisions, Liggett discovered that the Army was in deplorable shape after weeks of continuous and bitter fighting. Several divisions were combat ineffective, having less than 25 percent of their authorized strength. Liggett estimated that there were over 100,000 stragglers, which drained the army’s strength. A lack of draft animals immobilized the artillery. The army needed to rest and refit, so for the next two weeks Liggett allowed it to do just that and resisted pressure to do more than local attacks. More important, however, Liggett retooled and remodeled the First Army. He took particular care in retraining his infantry and artillery. Some infantry received special training in techniques for attacking strong points, while the rest were trained to bypass these defenses. Artillery batteries laid out supporting plans to use interdicting fires to isolate objectives and to conduct counterbattery fires against German artillery. Liggett instilled in his commanders the need to maximize supporting fires and gas to suppress enemy defenses. To prepare for the second phase of the offensive, Liggett ordered a series of limited attacks aimed at securing a suitable line of departure. Both III Corps, now under General Hines, and V Corps, now under General Summerall, launched local attacks to clear forests and seize hills in the center of the line. Some of these operations involved heavy and hard fighting, with the bloodiest being the I Corps’ ten-day battle to capture Grandpré, which fell on 27 October. Meanwhile, Liggett and his army staff ensured that supplies were stockpiled and roads repaired. By the end of October the First Army was ready for the next general attack. On 1 November Liggett’s First Army resumed the offensive. The main objective was the Barricourt Ridge in the center, a realistic advance of five miles. Once the Americans secured the ridgeline, they would push west to maneuver around the Bourgogne Forest, link up with the French Fourth Army, then drive northeast toward Sedan. On the first day of the attack Summerall’s corps, in the center, easily gained control of the ridgeline. 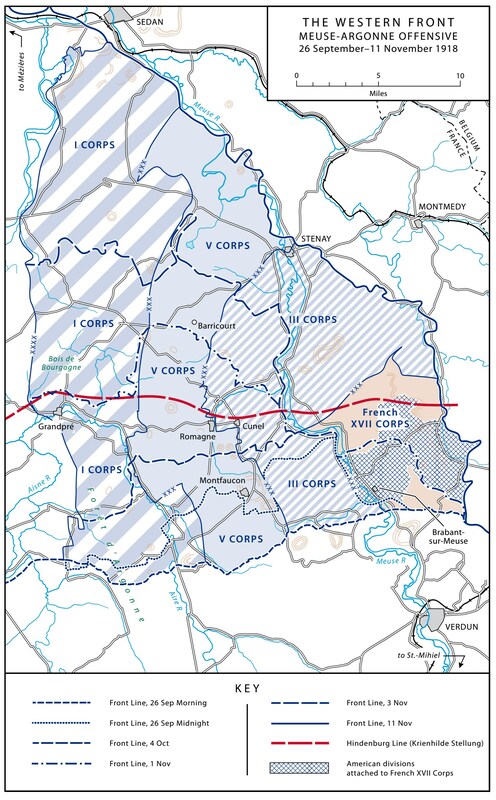 Hines’ corps, in the east, kept pace and advanced to the Meuse River. Only Dickman’s corps, in the west, failed to gain much ground. On the following day, however, the I Corps made excellent progress and cleared the flank of the French Fourth Army. Over the next several days, Liggett’s army continued to advance as fast as it could displace its artillery and supplies forward. At one point the advance was so rapid that it ran off the AEF headquarters’ maps. By 4 November the First Army had elements along the heights overlooking the Meuse and was able to place artillery fire on the railroad from Sedan to Mézieres. The Americans had achieved their objective. Liggett’s careful preparation of the First Army paid off. Infantry and artillery coordination was superb. Troops pushed through and around German strong points, while special assault troops reduced them. Improved staff work and coordination afforded the First Army the flexibility to bypass German defenses. Unlike former attacks that made strong first-day gains followed by smaller ones, this attack was different: the advance on the third day exceeded that of the first. Under Liggett’s tutelage, the American units had finally developed into a well-trained, well-organized fighting force. A week after Liggett’s forces reached the Meuse, the warring nations signed the Armistice. The fighting ended at the eleventh hour of the eleventh day of the eleventh month-11 November 1918. The Meuse-Argonne Campaign was the greatest battle that the U. S. Army had fought in its history. Almost 1.25 million American troops had participated during the course of the 47-day campaign. American casualties were high-over 117,000-but the results were impressive. The American First Army had driven forty-three German divisions back about thirty miles over some of the most difficult terrain and most heavily fortified positions on the Western Front. It had inflicted over 120,000 casualties on the Germans and captured 468 guns.